Yes, every singular burger coming out of this big yellow school bus is pretty excellent. Yes, everything -- including daily ground Angus beef, chipotle aioli, and buttery buns -- are made fresh in-house. And yes, you don’t truly need two crispy bacon grilled cheeses sandwiching two dripping half-pound beef patties for lunch right now, but detention is not the time to get all weak on us. Fresh. Homemade. And sloppy as hell. 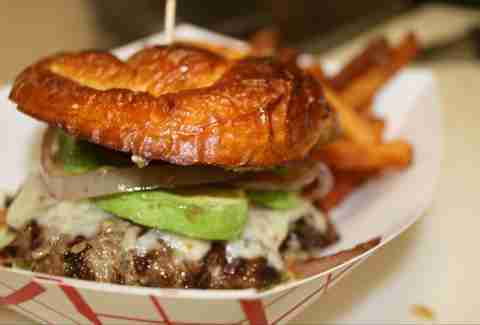 That’s pretty much all you need to know about this beer garden’s crazy good burger creations. Oh, and that you better not come wearing tight jeans. We can’t resist the classic Five Napkins, oozing with egg, slab bacon, and cheddar. But if you’re feeling crazy (and aren’t you always? ), go for the Grease & Weasel, because it comes with most of that but also two honey buns instead of bread. Yeah. 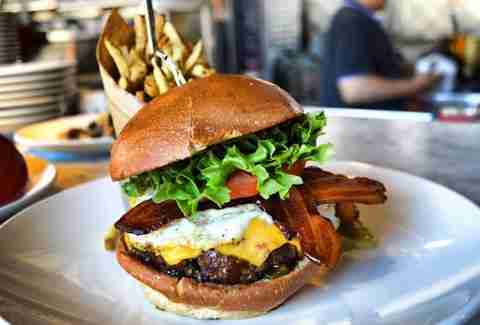 How you judge a burger just may be one of life’s most important questions. Is it by juiciness? By beef-to-bun ratio? By the choice toppings? Or perhaps it’s by all of the freaking above! 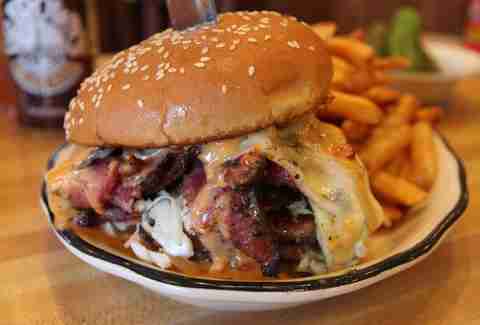 Hubcap’s custom-made buns are specially crafted to catch all of that inevitable beef juice drippage. And accoutrements like shaved ribeye, grilled wieners, and crunchy peanut butter are all kinds of delicious. Go with your heart, but purists can take solace in the fact that the Hubcap Decker is the gold standard of double cheeseburgers in town. You’ll be one Sad Mac if you don’t try a Moon Tower half-pounder at least once in your lifetime (but probably more than once). The Cheech comes stacked with thick bacon, sambal mayo, and creamy goat cheese; while the Chong is a beauty dripping with sunny-side-up egg, thick bacon, house pickles, cheddar, and Creole mustard. Pro tip: go for Wednesday BOGO Burger Night so you can try both. 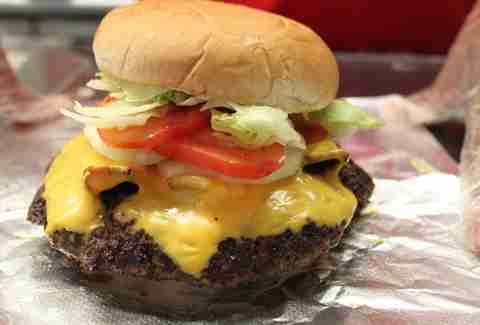 This old-school burger joint has been busting Houstonian’s belt buckles since 1961. Hit the place in stretchy pants if you want any chance of finishing its monster double cheese burger, but even more so if you’re tackling the Miss Piggie. The massive sandwich is made with a duo of fresh ground beef and bacon patty, with even more candied bacon, hash browns, and cheddar piled on top. Imagine if life were hard and you had to choose between a juicy Pat Lafrieda short rib/skirt steak burger and Kenny & Ziggy’s housemade pastrami melt. Well it’s not and you don’t. So at least you have that going for you. Star Wars fans and those who don’t get the reference are equally happy when this half-pound, egg-topped, smoked bacon- and cheddar-loaded beef bomb is presented before them. 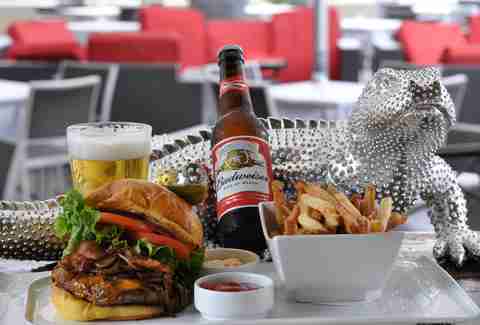 Buckle up and order some craft brews to wash it all down. You asked for it; they made it. 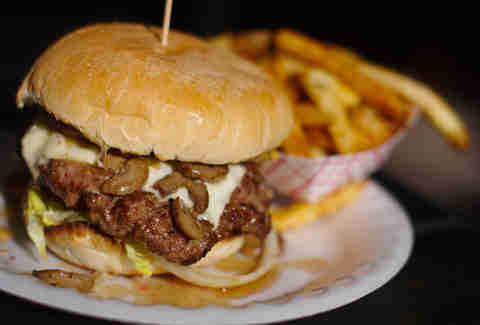 The Heights favorite took their meat chops to the next level when they debuted this namesake burger earlier this fall. Now you can get a duo of aggressively seared and seasoned 3oz Augustus Ranch patties covered in cheddar and served with house pickle toppers and a crazy good crispy potato side whenever you damn please (or more accurately, during lunch). 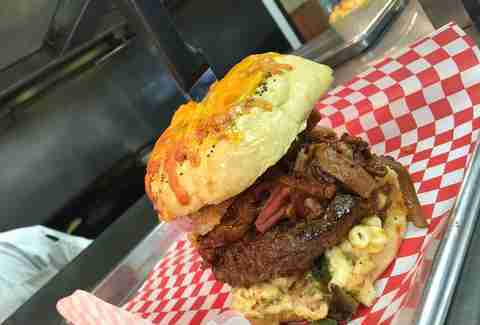 Somehow, even mac and cheese topped burgers feel fancy at this homegrown American restaurant. 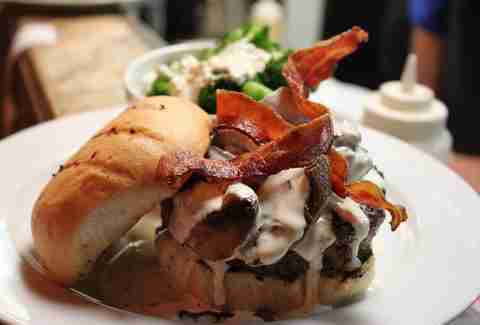 Piled onto Sheila Partin sweet sourdough buns, the Hulk-worthy 10oz chargrilled burgers get rubbed with Jonathan’s secret blend and topped with things like ‘shrooms, caramelized onions, bacon, and TEXAS GRAVY. It’d be criminal not to try them. 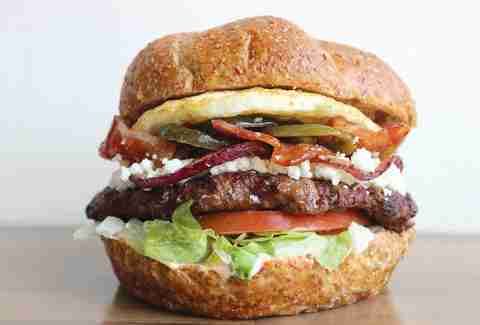 Christian’s flavor-packed burgers are local legends, so it doesn’t matter if you go bacon-bacon, chili cheese, or country-fried with your toppings, so long as you do go for the full pound patty. Warning: do NOT come to this retro eatery if you are trying to watch your figure. The smells wafting from the flattop will have you gearing up for an insanely bad-for-you burger faster than you can change your Coke to diet. 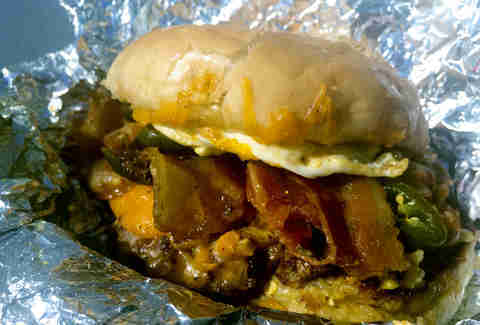 Since you went this far, you may as well go balls to the walls with the fatty bacon topped; sliced jalapeño, egg, and gooey macaroni & cheese-adorned Grim Burger. We have sad news: the famed Porkobucco has been removed from BAC’s menu. We don’t know what they were thinking, but we do know the only silver lining in this cloud of crap is that now you don’t have to decide between that and their very worthy Clubhouse burger. With a freshly ground 44 Farms patty flawlessly seared to a beefy crunch and green tomato/jalapeño jam accompaniment, we’ll let this one slide. The Rice Village location of this beloved eatery starting offering brunch seven days a week earlier this year, so if you’re having trouble choosing between breakfast and their fantastic cheddar, house-pickle, and aioli smothered burger... just add an egg. When a place is known for beef, you know they’re gonna make a mean burger. This half-pound steak burger is made with fresh ground Akaushi, aged cheddar, honey baked Texas pancetta, and grilled onions, all on a daily-baked challah bun. The buttery housemade pretzel buns are worth the trip to Spring alone. But the staff would probably look at your weird if you didn’t order a greasy, perfectly grilled burger to go inside, too. So do that and add avocado, pepper jack, and ancho mayo while you’re at it. Formerly Chief’s Cajun Snack Shack in the Third Ward, Big Chief still doesn’t go light on the Cajun spices when seasoning his hand-formed burgers, meaning every bite bursts with lip-tingling beefy flavor. 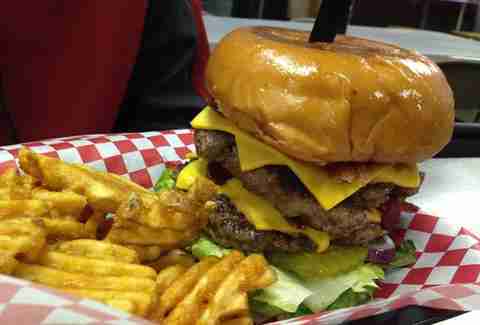 He also doesn’t go light on the patty itself, which is about three times the size of the bun that houses it. This brewhouse’s house-ground burger blend is badass. The charred, plump 44 Farms patty -- sandwiched inside a grilled eggy bun with a healthy amount of sharp white cheddar, pickles, and L+T -- is best taken down with a crisp Karbach brew. Just as it should be. 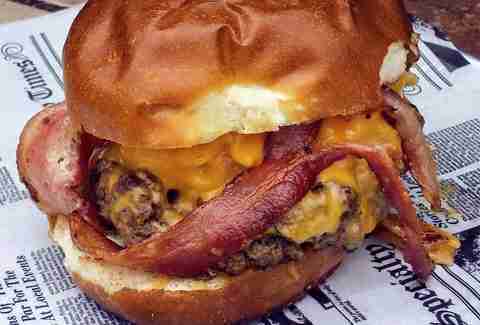 This gastropub may channel London, but their man-sized burgers are U-S-A all-the-way. 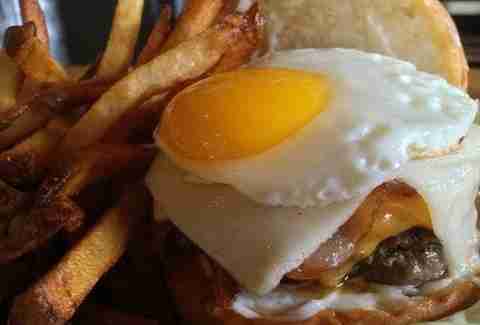 The Royale with Cheese -- in which house-ground beef gets loaded with Bhajia-style onion rings, a yolky fried egg, and a load of Gruyere cheese, all on a buttery brioche bun -- is fit for an American king. The Imperial at Grafitti's at Union St. 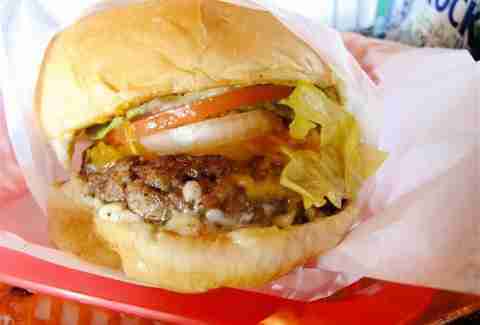 This barely year-old resto’ makes a burger that is worthy of a spot in Texas. Partially because the 100% Angus medium-well patties are on point; but also because the burgers are jaw-breakingly gigantic. Open wide to take in the stacked Imperial -- which has roasted poblanos, a fried egg, crispy onion strings, mac & cheese, and bacon chunks packed onto its half-pound short rib and brisket patty. 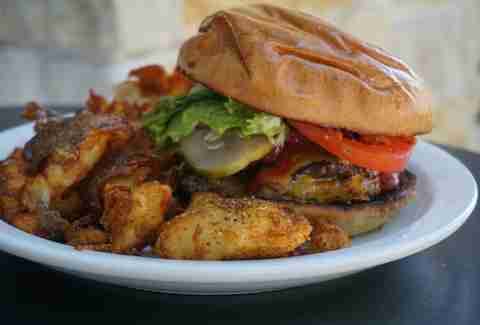 With an emphasis on using humanely-raised, all-natural beef and chicken, and locally sourced ingredients, this burger stop pays a lot of attention to its product. Which can only mean you don’t have to pay any attention AT ALL when building your very own JerryBuilt burger. Whatever you do, add chili cheese fries. 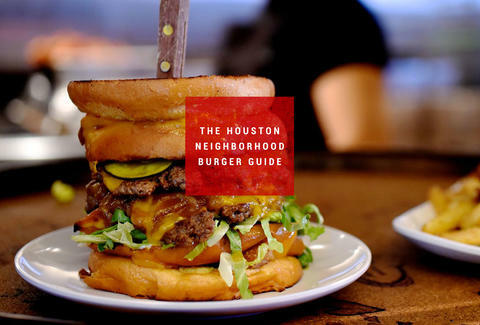 Brooke Viggiano is a Houston writer who thinks the burger is up there with the wheel, the printing press, and electricity. Follow her at @BrookeViggiano.